On Tuesdays we are thrilled to fling open the doors to all of YOU! We love hearing your dreaming stories…the lessons you’ve learned, the roads you’ve walked, the dreams He’s planted in your hearts! Today we are so excited to welcome sweet Meredith Bernard, a God-sized Dreamer who shares an important reminder that God can and will make a way if our dreams are from Him. We know her words will encourage you today! I don’t remember the exact moment the seed was planted, but I knew when it took root. The seed to leave all I had worked so hard for and the comfort that came from being the strong-willed woman I was. That skin fit because it was the only skin I had ever worn, but it was starting to suffocate me. Four years of college and two years of graduate school gave me an identity and a job that led to praise and worth. For a while, that was enough. Then life happened. Life full of its hills and valleys. Its would-haves and could-haves and should-haves. Life in-between the messy sheets of a divorce and remarriage, a new family and a new job. Life in the midst of loss and grief and finding myself after realizing I never knew who I was after all. Life before children. Life after children. And in the aftermath of these two souls born into this life void of caring for more than self…life changed. The way I viewed the world changed. The way I viewed myself and everyone around me, changed. I was seeing with a new pair of eyes. Tired and weary as they were in the dawning light of new motherhood, they were seeing the world more clearly than ever. What wasn’t important before was now more important than ever. What was the most important before now lost sight altogether. When the seed of doubt sprouted that I was doing what God really wanted me to do, I did what I do so well. I ignored it. I was happy with my career. Well, I was happy with the security and provision I saw my career bring. I told myself that my family could not do without them. My husband is a farmer. A land and cattle poor farmer and thus we would be poor. It was up to me to support this family unit. Or was it? Sometimes God tugs on our hearts until it becomes a tear. His tear on my heart cut deep and wide, exposing the raw truth that I was missing out. Someone else was raising my children and I was missing all the little things that make the whole. People would often say, “I don’t know how you do your job and find time to be a mother, too. You have a great job. I wish I had your job…” Yeah. I didn’t know how I was doing it either. As the pressure increased to perform and be gone more, I began to realize I couldn’t do it after all. It was the scariest thought of my life. That I would give up the job that everyone else wanted, to stay home with my kids. That was not what I did. That was not who I was. But it was who and what God was tearing my heart out to believe could be done and I had to trust that in Him that all things really are possible. So I quit. And I felt freer than I had since the day I gave my life to Christ. 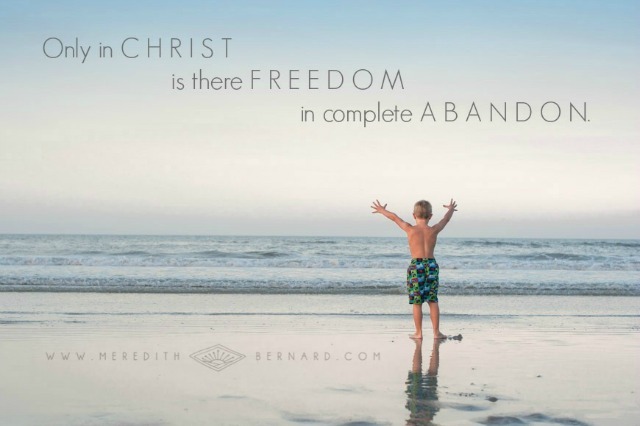 Only in Christ is there freedom in complete abandon. Only in Christ do our dreams reach the potential He can give them. In the nine months since I quit my job to pursue the dream of staying at home, He’s also led me down the path of other fulfilled dreams. I’m a photographer and I’m a writer. Those are hard words to identify myself with or feel worthy of identifying myself as, but through God’s grace, that is the truth. That is my truth. I’m sharing life through my lens and my pen and finding myself along the way. I’m also finding Him through the endless loads of laundry, bottom wiping, name-calling police, sibling rivalry referee and 1,532,854th way to cook hamburger for supper. My new job isn’t easy, but it’s oh. so. worth it. And I wouldn’t trade it for the world. 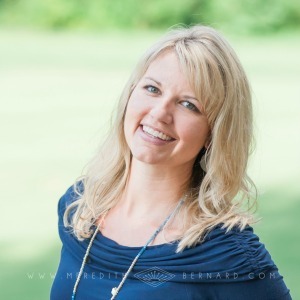 Make sure to visit Meredith at her blog today! She’s giving away a beautiful Lisa Leonard necklace! Oh Meredith, this makes my heart smile. What a gift you’ve given your family to be at home with and for them, even in spite of the significant cost. Grateful that you took the leap. May the Lord bless you for it. Meredith, it is wonderful to see you here! I am so glad that you surrendered to that call. What a brave soul you are. You are a a blessing and an encouragement to others to pursue their dreams and follow the dream God places in their heart. It’s not easy, but it’s so worth it. Isn’t it amazingly wonderful how God allows us the glimpse of something to come when we take that step of faith, and THEN fills us with awe as He shows us on the “look-back” how He was there all the time cheering us on?! I want to encourage you to not listen to the enemy or the crowd echoes by saying you don’t feel worthy somehow to “call” yourself “writer”. It saddens my heart greatly to see people saying that over and over on the blogosphere… on sites that God called into existence. Why? Because when God calls us to do something, He makes us that something for a reason. His glory. If you are sharing His glory and grace, and you are, then He has called you to write… to be a Writer. A writer for God. Even before I was paid to write, I felt that He called me to it… years ago. I calked myself what He called me. Writer. Authorship is writing something from your heart, mind, and soul… not just words that bring in money. He authored you and now you are sharing through words. You go out as Writer Meredith Bernard … and be proud in The Lord for that gift He gave you. A good, God-ordained, head-to-His-face kind of proud. He’s proud of you, Sister. Ps – My giant leaps? I live inside a God-sized Dream bubble, and I love it! Thank you for sharing your story. I can identify with your feelings. The fear of letting go of the person that we’ve fought so hard to become, to find freedom in letting God transform us into who He wants us to be, for His glory! 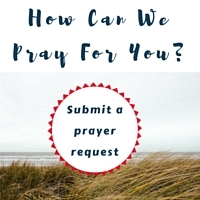 A long time ago God had placed a desire to write and speak in my heart, but I’ve let the all too familiar doubts and fears be stronger than my faith. This year, the burning desire in my heart became a tear. I quit my career in February to build a ministry with my husband, and the move also opened time for me to practice my writing. It has not been without struggles, but I keep pressing on to the goal, in faith, with courage. God bless your work and thank you again for sharing! It is encouraging to find hearts that share the same passions, and struggles. Thank you again! I’m printing this right now so I can read it and remember to don’t give up.”Dig in and plow through”! Yay!! So proud of you for taking that HUGE leap of faith. You area very talented photographer and writer. Your story is a great reminder that God is always faithful when we decide to trust Him. So happy to see you over here today! Keep offering your words, your life, friend- they make a difference! Sweet friend, thank you for sharing your story. I love this so much! I am on the opposite side of your story. I know the time for me to go back to work is drawing close, but I can’t seem to identify myself as anything but a mother any more. I have lost my confidence in my ability to be a professional. Isn’t funny how the enemy traps us where we are at because he doesn’t want us to reach our God-given potential?! Love you, sister. Thanks again! A wonderful testimony to surrendering our lives to God. There is not another “job” on this earth that will give more rewards than pouring your life into your children and family. Love your post – and your beautiful photograph! Thank you for sharing with us! 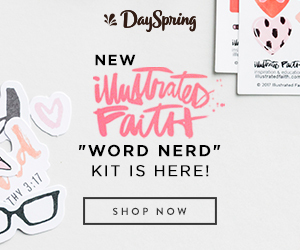 Glad you said “YES!” when God called you – I know your story will be inspiring to many others. 🙂 Just wondering, will you be at Allume this fall?